Sierra Nevada Corporation, one of NASA’s Commercial Crew Program partners through the agency’s Commercial Crew Integrated Capability (CCiCap) initiative, recently performed incremental tests of its reaction control system, which will help maneuver its Dream Chaser spacecraft in space. 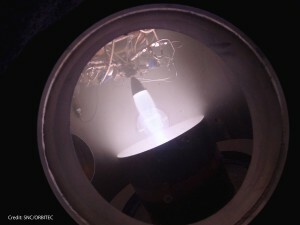 The company’s Milestone 15a built on SNC’s previous propulsion system development efforts by implementing a compact prototype thruster operating in a vacuum chamber to simulate an on-orbit environment. Next Next post: Hey Kids – Contribute to the 2015 Commercial Crew Calendar!